The Golden Handoff shows retiring agents how to profit for years after they stop selling and ensure their clients are cared for. 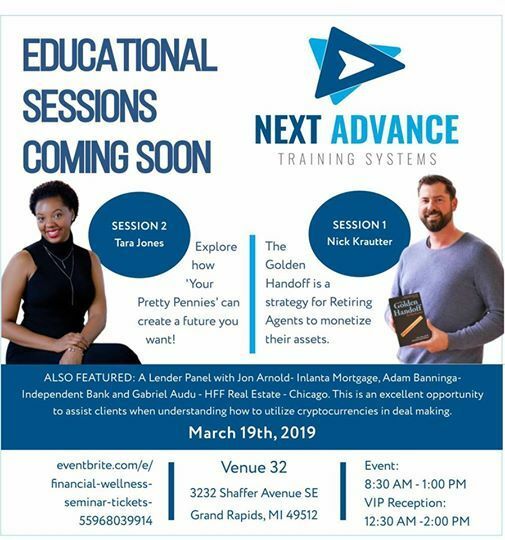 Nick will teach agents and brokerages how to grow exponentially by Referral through adopting the clients of retiring agents. It’s a powerful way to sell your business. Eight out of ten small businesses fail within the first three years of launching due to poor business and personal financial management. In this workshop, Tara Jones will teach you how to successfully separate your business and personal finances, create a profit-focused business financial model, and a personal financial plan that helps you consistently achieve your ideal lifestyle. Learn from her personal financial story about how you can create a vibrant lifestyle. *Are you ready to start using your income in a way that ensures you are financially secure, solid, and stable in both the short-term and the long-term? If you answered YES, allow Tara Jones to walk you through the next 7 steps you can to take to create a financial plan that will have you consistently achieving your business and personal financial goals. *Value Driven Entrepreneur - Donna Tashjian-Life Coach from Vibrant Living International. In this fun and interactive workshop you will learn how to avoid common pitfalls of entrepreneurs by utilizing 6 habits of successful value-driven business owners. *Lender panel workshop on Cryptocurrencies and their Role for the Future! 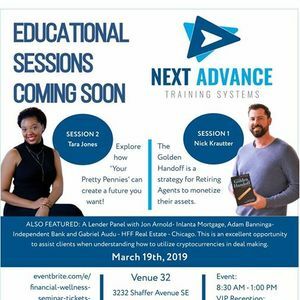 Featuring Jon Arnold with Inlanta Mortgage, Adam Banninga - Independent Bank and Gabriel Audu - HFF Real Estate - Chicago. This is an excellent opportunity to understand how to assist clients when transacting deals with cryptocurrencies. The workshop will be facilitated by Katrina Cole. VIP Reception Luncheon with Nick Krautter! Enjoy a wonderful lunch and Nick will entertain your thoughts and questions. Order your special lunch ticket below.